Love the lying Haaretz headline. The NATO backed Kurdish militias alongside NATO special ops are making their move to annex Syrian territory- Period. There is not and never has been anything but perverted war theatrics between Kurds and ISIS- Yes, people die. People always die when a political agenda is being undertaken. I’ve said it repeatedly and I will say it again- Not caring what lies others want to believe. Choosing instead to see what is happening right in plain site. Annexation of Syrian and Iraqi territory. For Sykes Picot redux and the 2nd Israel. In Turkey the annexation process has just begun, but is definitely occurring. I've stated these things plainly for so long now, yet, still people haven't caught on. I can't understand how that is possible?! Pay attention to the truck the masked YPG is driving in! What is it? The exact same truck as ISIS drives. Coincidence? NO. Not at all. No coincidence. I've posted pictures here previously of YPG driving around in the same Toyota's as ISIS. Cheer for Kurdish militias. Cheer for ISIS. Cheer for the destruction of Syria. A classic controlling both sides of the fight in order to guarantee the outcome. Quite a twisted & perverted reality created by the elites for the masses. One more thought! It's been reported that wages were cut by ISIS for Syrian 'fighters' so mercs were leaving, maybe for Libya? Making it easier for PKK to 'fight' ISIS in Syria, no doubt. Funny how that worked out? The powerful Syrian Kurdish YPG militia and its local allies have drawn up plans for a major attack to seize the final stretch of the Syrian-Turkish border held by Islamic State fighters, a YPG source familiar with the plan said on Thursday. Such an offensive could deprive Islamic State fighters of a logistical route that has been used by the group to bring in supplies and foreign recruits. Annexation by any other name is still annexation. Concerns for Syria's territorial integrity? Where are they? They must be in the the same place as concern for Iraq's and Turkey's territorial integrity and respect for existing borders. Israel must be waiting for the moment it can pounce on the rest of Golan. But it could lead to confrontation with Turkey, which is fighting against its own Kurdish insurgents and sees the Syrian Kurds as an enemy. After a year of military gains aided by U.S.-led air strikes, the Kurds and their allies already control the entire length of Syria's northeastern Turkish frontier from Iraq to the banks of the Euphrates river, which crosses the border west of the town of Kobani. But Turkey says it will not allow the Syrian Kurds to move west of the Euphrates. The source confirmed a report on Kurdish news website Xeber24 which cited a senior YPG leader saying the plan includes crossing the Euphrates to attack the Islamic State-held towns of Jarablus and Manbij, in addition to Azaz, which is held by other insurgent groups. The source did not give a planned date, but said a January 29 date mentioned in the Xeber24 report might not be accurate. The YPG has been the most important partner on the ground of a U.S.-led air campaign against Islamic State, and is a major component of an alliance formed last year called the Syria Democratic Forces, which also includes Arab and other armed groups. The alliance is quietly backed by Washington, even as its NATO ally in the region, Turkey, is hostile. Ankara fears further expansion by the YPG will fuel separatist sentiment among its own Kurdish minority. (there was no separatist sentiment- approximately 50 percent of the Kurds voted for Erdogan) It (Turkey) views the Syrian Kurdish PYD as a terrorist group because of its affiliation to Turkish Kurdish militants. The United States and Turkey have for months been discussing a joint military plan to drive Islamic State from the border, but there has been little sign of it on the ground. Pretty sure I explained months back that this joint US/ Turkey plan was a no go- With the US just paying lip service to Turkey. While they stuck the knife in and turned it! "Washington doesn't want a safe zone- And their 'fight' against ISIS has been a cover all along for the Kurdish/Israeli land grab. Turkey wants the safe zone because the leadership of Turkey understand exactly where that Kurdish land grab will lead.. To the destabilization and destruction of Turkey"
Russia said on Thursday it wanted to hold an international meeting on Syria -- including key players from the West and the Middle East -- in Munich next month. 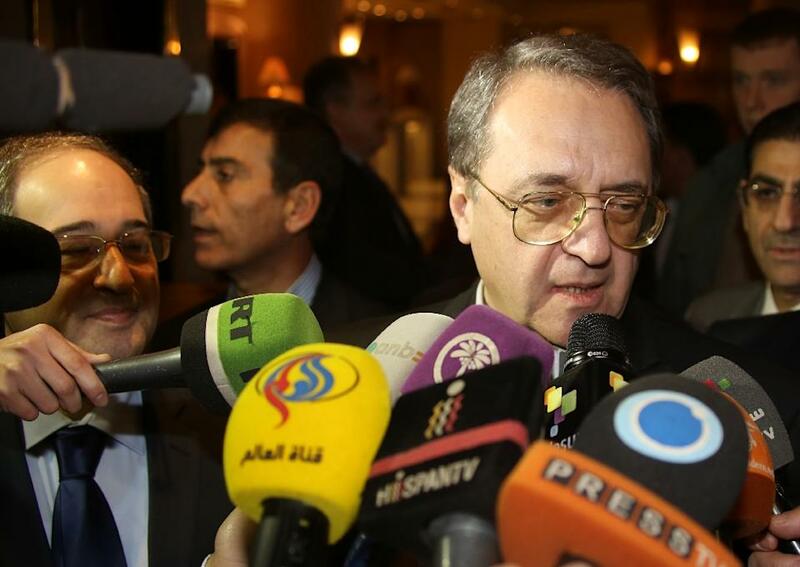 "There is an agreement in principle between Russian Foreign Minister Sergei Lavrov and Secretary of State John Kerry, and now we will propose to all the other participants of the international Syria support group a time and place -- Munich, February 11," state news agency TASS quoted deputy foreign minister Mikhail Bogdanov as saying. Advisor to the Supreme Leader of Islamic Revolution Ali Akbar Velayati said that the Zionist regime policy is to based on disintegrating Islamic countries of the region by sowing discord among them. He made the remarks in a short interview with Turkish newspaper Aydinlik. On the sidelines of an international conference dubbed on dangers of Takfiri groups in today's world, Velayati in reply to a question asked by Aydinlik correspondent concerning statement of the Israeli justice minister on establishment of a independent Kurdish government between Iran and Turkey, said that the regime will not reach this goal at all. Velayati said that the aim of the Zionist regime is to establish a second or even a third Israel in the region and added that the aim of imperialists and the Zionists is partition the whole region. Turkish troops reportedly crossed into jarablus days ago prompting a Russian warning. It would appear the mention of the town isn't an accident. Us ambassador in Russia saying no knowledge of the us airbase in nw Syria. Russia supose to meet turkey official in forum cancels trip 21 health reasons. 2 days before a bunch of report of Turkish troops entering Syrian. Jpost picks up the story from 'Turkish' media. "“Eyewitnesses to the incursion reported that the Turkish forces have not encountered any resistance from ISIS fighters, which raises the question of possible collaboration between ISIS and Turkey"
If no ISIS per Jpost reports, why go to the town? "Turkey’s gas grid and Gazprom had agreed upon a 10.25 percent of gas discount, but this decision has never been effective"
"Gazprom has failed to sign the amendments regarding the agreement on price discount between the two companies," Botas said in a statement. It said it had written a final letter to Gazprom calling on it to sign the deal"
I'm not sure of the relevance? Does the leak have something to do with NATO call out of AWACS and the US base in the NE - alleged that is. OR something to do with Sinai shoot-down? Reports yesterday of suspects identified. Putin Looks for Regime Change in Turkey- NOT ! Three Cheers for the PKK?